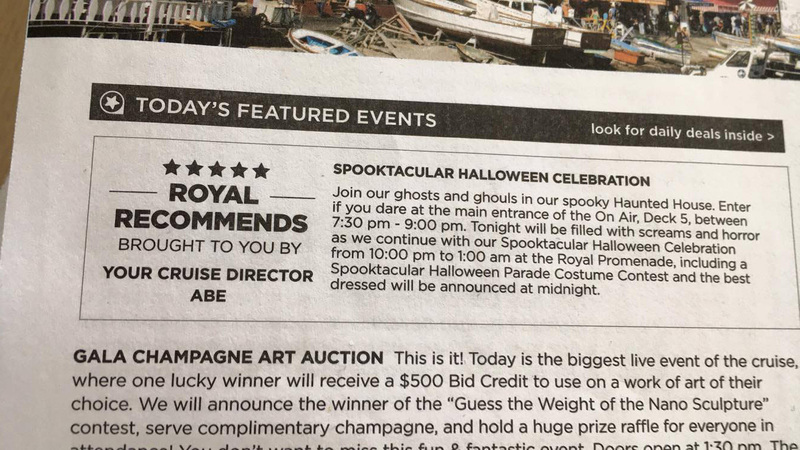 With today being Halloween, Royal Caribbean is celebrating this spookishly fun holiday across its fleet, including onboard the brand new Harmony of the Seas. Many blog readers ask about how Royal Caribbean celebrates a holiday like this, and today we have some fun photos to share from some lucky guests onboard. Royal Caribbean created a Haunted House in the On Air Club, and Anna-Carin Littson shared with us photos of this venue. From Harmony of the Seas' extensive lineup of entertainment on for the whole family to kid-friendly spaces onboard, Royal Caribbean's newest and most innovative ship has something to offer guests of all ages. Young cruisers can enjoy Splashaway Bay waterpark or get active on the Lucky Climber, while teen have their own dedicated spaces such as a disco and lounge with video games and foosball. Watch a timelapse video of the world's largest cruise ship, Harmony of the Seas, sail away from Malaga Spain. Captain Gus Andersson briefs his team on the bridge as Harmony of the Seas sets sail on a historic transatlantic crossing, clearing the Strait of Gibraltar for the homestretch to her new home in the U.S.
A historic journey is underway as the world's largest cruise ship starts her epic transatlantic voyage. Harmony of the Seas, Royal Caribbean's newest and most innovative ship, leaves Barcelona, Spain, to venture across the Atlantic to her new homeport of Ft. Lauderdale, Florida. Hear from Captain and crew about what it takes to make this epic journey. Royal Caribbean's Harmony of the Seas offers guests quite a bit to see and do onboard, and the ship itself is a marvel, when you consider just how large it is and how much work and coordination is required to make it run flawlessly. Here are some fun facts about Harmony of the Seas that put into perspective the sheer scale of everything on this ship. The AquaTheater pool is 17.9 feet deep; the largest performance pool at sea. The Central Park neighborhood is the fist ever (along with Oasis of the Seas and Allure of the Seas) living park at sea with 10,600 plants, 52 trees, 2 Living Walls containing 10,240 live plants and 70 tons of plating soil for them to grown in. All plant material is contained in 2200 modules within 46 planter beds. The entire park is automatically irrigated with a state of the art system to include a Fertigation unit. 5,070,632 lbs. of water in the swimming pools. 110,231 lbs. of ice cubes made every day. 4,700,000 lbs. of fresh water consumption per 24 hours. 181 grand blocks were used to construct Harmony of the Seas, each block weighed approximately 1,200,000 lbs. (600 metric tons). 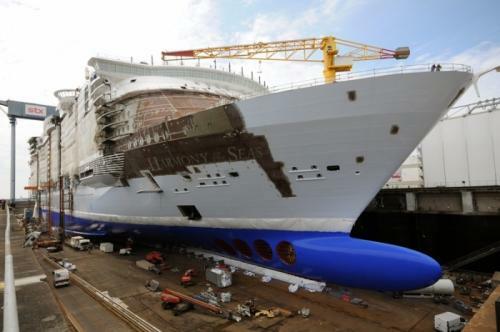 Harmony of the Seas was constructed out of 500,000 individual parts. 3,300 miles of electrical cables. 1,614,586 square feet of air conditioned area. 968,751 square feet of carpet. 86,111 square feet of windows. 7,000 works of specially commissioned art. The building of the cruise terminal 18 in Fort Lauderdale took 62,572,500 pounds of concrete, the weight of 782 18-wheeler trucks; 33.3 miles of conduit; and 153 miles of wire, which would stretch from Fort Lauderdale to Key West. 20 Chefs, 222 cooks, 102 sanitation & culinary cleaning crew. 15 Bar managers/supervisors, 188 bar tenders & bar servers. 25 food service areas including a 24 hour Crew Windjammer. 37 front bars and 26 back-of-the-house support bars. 28 galleys operating independently, some with a 24 hour operation. Total of 108 catering areas, bars, galleys, pantries, provision food preparation rooms. All breads and pastries are made fresh onboard. Our bakery has a machine that makes 4,000 bread rolls in 1 hour. Have the most efficient and most innovative galley equipment onboard the Harmony of the Seas. Each restaurant operates independently with own galleys and culinary & service teams, even each deck of the main dining rooms. 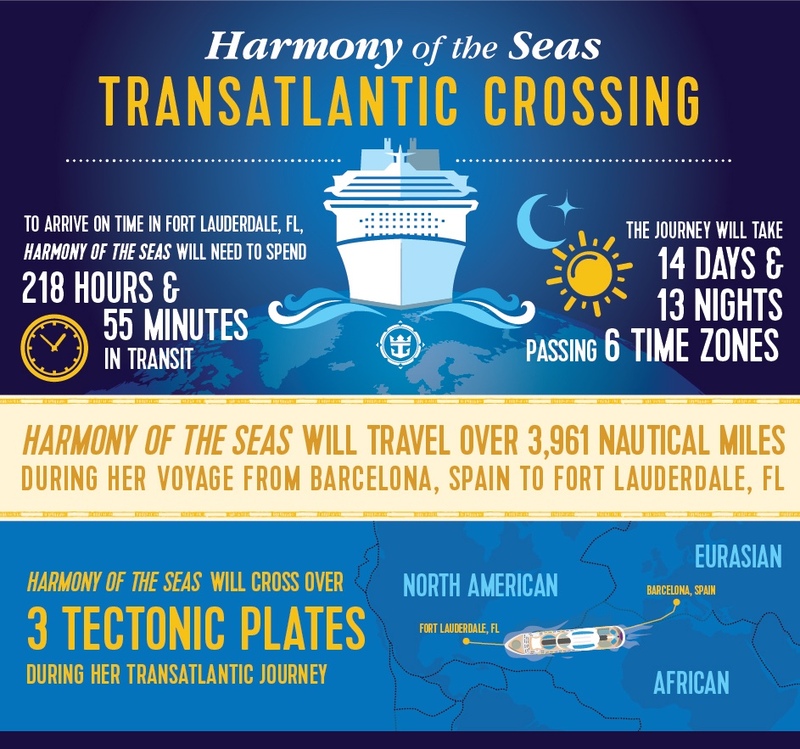 Royal Caribbean's Harmony of the Seas is making her away across the Atlantic to her new home in Port Everglades, Florida, and Royal Caribbean has released a new infographic that shows off how long this journey really is. Harmony of the Seas will arrive in Port Everglades, Florida on November 5, 2016, in the early morning hours. You can track Harmony of the Seas' progress during her journey, via our Harmony of the Seas ship tracker. Royal Caribbean has found its Godmother for its newest cruise ship, Harmony of the Seas, and that person is South Florida educator Brittany Affolter. Brittany’s work with Teach for America in Miami-Dade County has supported and inspired a number of high-needs schools in Royal Caribbean’s hometown. Following a search that lasted months, Affolter was among three finalists, who then competed in a vote by the general public. Brittany was won that popular vote, and was selected to become the ship's Godmother. For winning, Affolter will be recognized for her incredible contributions to the education of South Florida youth with a grant of $25,000 donated by Royal Caribbean. The grant money will be donated to Teach for America Miami-Dade. In addition, Affolter will have the privilege to officially name the ship and bless the vessel and all those who sail onboard, during the prestigious naming ceremony at Port Everglades in Fort Lauderdale, FL on November 10, 2016. Brittany will take part in the inaugural cruise and then be invited back to enjoy a seven-night Caribbean voyage on he Harmony of the Seas. An overview of Harmony of the Seas like you’ve never seen. The world’s largest cruise ship is packed with bold and unexpected lineup of experiences found nowhere else on land or sea. Royal Caribbean's Harmony of the Seas is filled with a lot of fun activities, exciting shows and incredible dining choices. The level of detail on this brand new ship is truly amazing, including one very small (and cute) bit of detail that is easy to overlook. Hidden in the Central Park neighborhood, among the beautiful trees, shrubs and flowers, is Tony the Garden Gnome! Tony was donated by Matt and Samantha Alexander, and have been adopted by the ship's horticulturist, Tom Brownlee. Guests can find Tony under a tree, opposite the Trellis Bar in the Central Park neighborhood. While not as thrilling as the ship's water slides, Tony is a great example of a fun hidden gem onboard Harmony of the Seas that you can visit once onboard.